On October 2nd, the countdown for the last 90 days of 2018 begins. In those last 90 days, we enter the busy holiday season, full of food, family, and let’s be real, laziness. (I often call it hibernation in order to feel better about it). During this time, we typically start letting go of our routine and goals. We promise ourselves that we will return to them after the start of the new year… even though we have an entire quarter of the year to go. So, we’ve put together three suggestions on how you can stay on top of your spiritual growth these next 90 days. Read them, make a plan, get some accountability, and stay in the Word during the holidays. 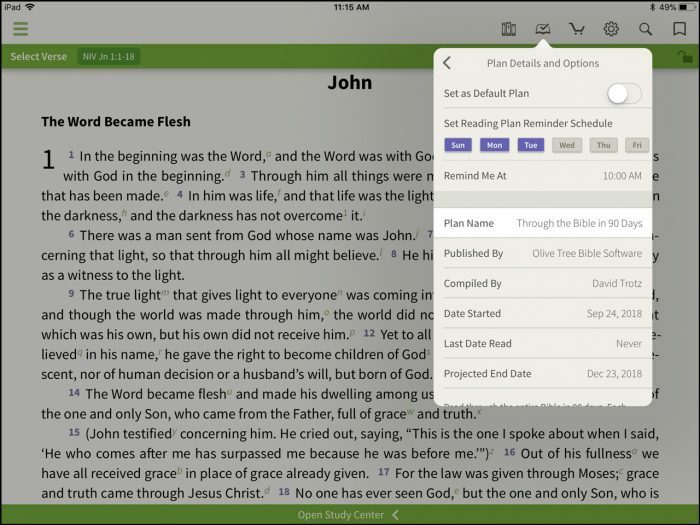 Our latest update brought a big change to the app: audio Bibles and books. However, that wasn’t the only change! On iOS devices, you can now add the Verse of the Day as a widget. You can quickly see the verse and the image, without even opening the app. Hopefully, this will keep your mind more focused during these last 90 days. Use this as a daily reminder to get into the Word. 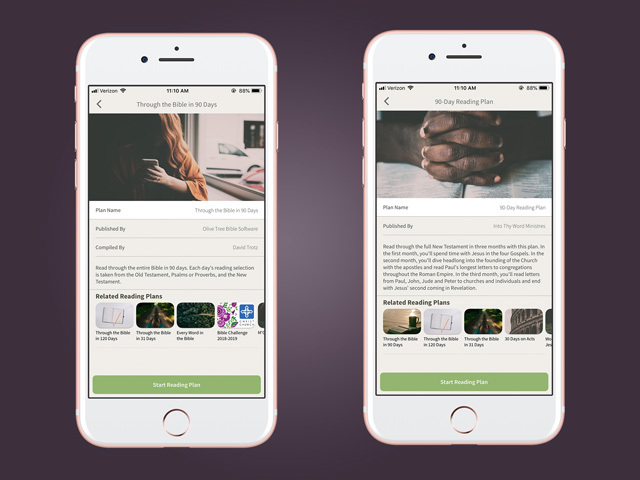 We have two 90-day reading plans in the app that can encourage you to get in the Word daily! This reading plan takes you through the ENTIRE Bible in 90 days. Each day’s reading comes from the Old Testament, Psalms or Proverbs, and the New Testament. This reading plan takes you through the New Testament in three months. During the first month, you’ll spend time with Jesus in the four Gospels. In the second month, you’ll read Acts and Paul’s longest letters. Then, during the last month, you’ll read letters from Paul, John, Jude, and Peter, ending with Revelation. Don’t Forget to Set a Reminder! You can set a reading plan reminder schedule. Choose which days you want us to send you a reminder, and at what time. This way, you’ll never forget to get in God’s Word. It can be easy to lose motivation when you find yourself doing the same study methods day in and day out. 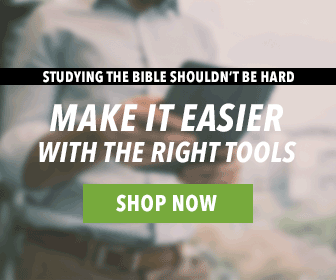 Here are a few posts we made that can teach you to read the Bible in new ways. Want to make an even bigger change? Try listening to your Bible instead! Here’s a link to all of our audio Bibles. And if you interested in audiobooks, we’ve got that as well. 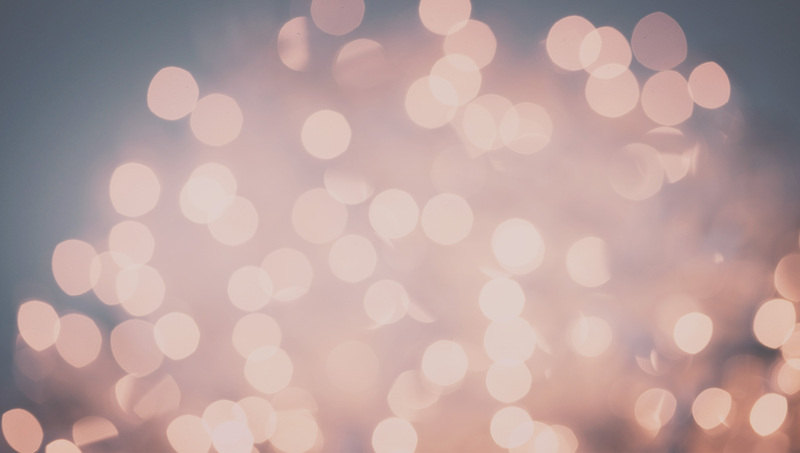 Make a pact with yourself today that you’ll end 2018 on a high-note—especially when it comes to spiritual growth. Pick one or all three of these suggestions and stick to it! I was under the impression that something was ready to read for the next 90 days not examples. I’m disappointed. I was looking for guidance and help not examples some of us have no clue. Hello Kim. I had the same impression and disappointment as you. In fact, I was expecting something similar to the “summer devotional” which OliveTree gave away a few years ago. That said, I’m wary of most devotionals, as they tend to skip around, losing the context of the text. There’s also the danger of just reading the comment instead of thinking and praying about the text oneself. Above all, I would encourage you just to read and pray about what you read. Don’t feel guilty if you miss a day, just carry on from where you left off the next day. Don’t worry about having to read a certain number of chapters every day. Far better read 3 or 4 verses, understanding and applying them, than 3 or 4 chapters with no impact on your life with Christ. That’s 81 days, which allows a few extra days to split up longer chapters. Don’t be afraid to discuss what you’ve read with your pastor or friends. I hope you find that helpful and pray that God will encourage you through your reading. Remember that the purpose is to get to know Him better, not to fulfil a duty. Fantastic suggestion. Found it useful, practical and easy to grasp. That’s a great suggestion. Thanks. Jesus said that God has hidden the truth from the wise and prudent and revealed it unto babes. So being humble and hungry is the prerequisite for Bible knowledge. Read on your knees, in humble prayer asking God for understanding and to bring the right people (and other literature) into your life. Like Jesus said, “Many will say, ‘Here is Christ. There is Christ.’ Go not after them for the Kingdom of God is within you!” True repentance from sin and water baptism are the beginning of walking in the light as He is in the light. God be with you and give you much grace. Whether one is a new believer or has been on the journey for a long time, this is a great help to grow in faith.